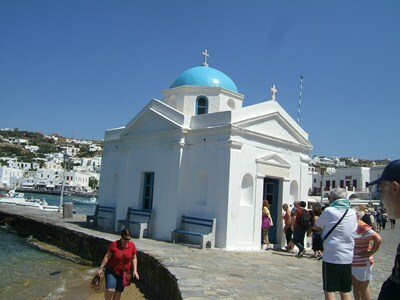 Day #7: Mykonos, Greece Our ship arrived in Mykonos at 12:30, a half hour ahead of schedule. We didn’t sign up for a tour as none of them seemed to do anything special or go anyplace that we really wanted to see. We didn’t go to the trouble of waiting in line for a tender ticket either. Instead, we just wandered down and picked up our tender ticket before lunch. We were on tender #13. That sounds pretty far down the list and I thought maybe it would take forever to get to the island but it wasn’t really a big deal. Several tenders were running at a time so people were transported quickly. Tenders began leaving the ship at 1 p.m. We sat on our balcony and enjoyed viewing the island and watching the boats coming and going until our number was called at about 2 p.m.
On the island we spent the afternoon quietly wandering the little streets and back alleys and visiting the many shops. We climbed uphill to see the windmills and the lovely view of the sea. 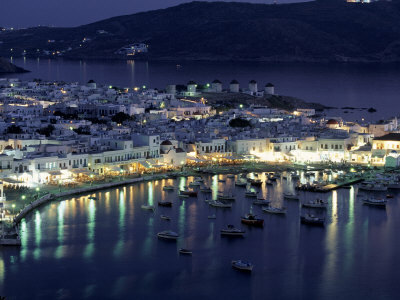 From the ship, Mykonos looks like a large brown rock with white houses scattered along its shoreline and up the sides of the hill. 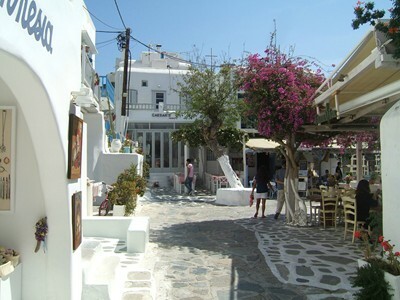 Once on shore, it’s very pretty with potted plants and hanging vines and flowers all around the shops and houses. 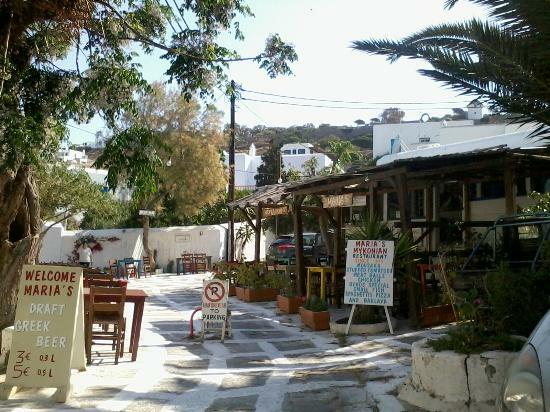 Maria’s, Mykonos, Greece: We were late for lunch and early for dinner so no one was sitting at any of the brightly colored outdoor tables when we walked up. We asked the waiter if they were open and he indicated that they were. We sat down at a bright red table and were handed menus. I ordered spagetti with chicken, peppers, mushrooms. The red sauce was very light and delicious. Doc had spagetti with shrimp in a cream sauce. Also delicious. Doc ordered a glass of wine and it came filled nearly to the top. I found it odd that no bread was served with the meal but we didn’t ask for any either so perhaps it needed to be ordered separately. The pasta was so good though that we didn’t miss it. The restaurant is on a little back street not far from the main drag. It’s a charming place with different colored tables and surrounded by flower boxes, trees and vines. We sat under the awning in the shade but there were also tables out in the open. The waiter was very friendly and my husband enjoyed talking with him about the NBA once we discovered that he is a huge fan and knew all the American teams and players. 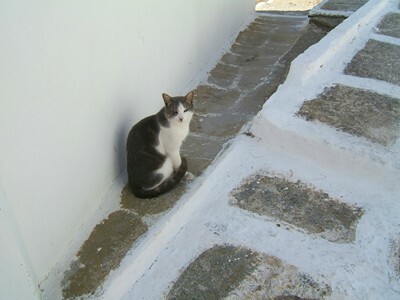 Strary cats wander all over the island and we enjoyed watching them as we ate. As we were sitting enjoying the scenery, another couple sat down at a table at the other end of the covered area. After ordering a drink, the “gentleman” proceeded to remove his shoes and socks and pick at his feet! We were glad to be seated at the other end of the restaurant! At about 5:00 we were tired, this being our first relaxing day following the hectic back to back tour days in Athens, Izmir, and Istanbul. We decided to head back to the ship early and we had no problem catching one of the tenders. One of the ship’s musicians, Pablo, whom we had met earlier in our trip got on with his wife, Alexandra and they came over to sit by us. We had a great talk about our families and our cats. 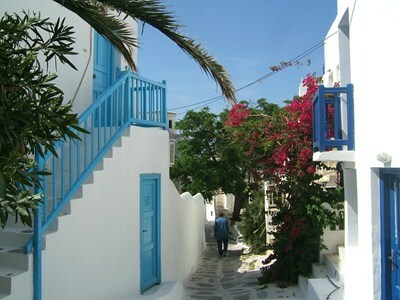 Mykonos was the port I was least looking forward to since there is really nothing to do there but shop and eat. But it turned out that that is exactly the sort of day we needed after our busy week — Relaxing with nothing pressing to see or do.